A guard tower stands behind the wire fence at California State Prison, Sacramento. SACRAMENTO, Calif. -- Correctional officers quelled a fight that left one New Folsom Prison inmate shot and at least 10 others hospitalized with stab or slash wounds, officials said Wednesday. 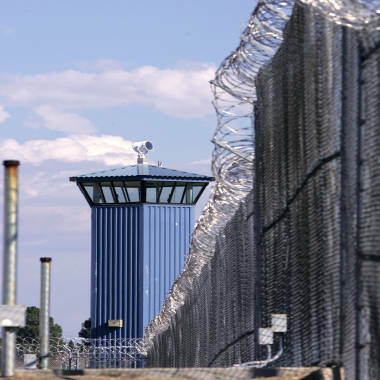 State Corrections officials said the fight involving an unknown number of inmates broke out shortly after 11 a.m. in one of the yards at what is formally known as the maximum-security California State Prison, Sacramento, which houses 2,600 inmates. Officials said that besides using less-than-lethal force, an officer using a rifle shot one inmate, who was taken to an area hospital for treatment. The inmate's condition has not been released. Officials said it appears that no prison staffers were injured in the incident. Nearly a dozen inmates were taken to outside hospitals after a riot at the same prison in December. This article includes reporting by The Associated Press.